Opis: Intense ultraviolet light from massive, hot stars in the Orion region has sculpted and compressed clouds of dust and gas in to distinctively shaped Cometary Globules. Seen in this IRAS infrared image recorded at a wavelength sensitive to emission from dust, the elongated globules are easily visible along with a bright region which corresponds to the Trapezium star cluster. Otherwise known as the Witch Head Nebula, IC 2118 is the string of globules near the middle right. Suggestively similar to comets in general appearance only, Cometary Globules are interstellar condensations on a vastly different scale. These are likely related to star formation episodes in the Orion molecular cloud. 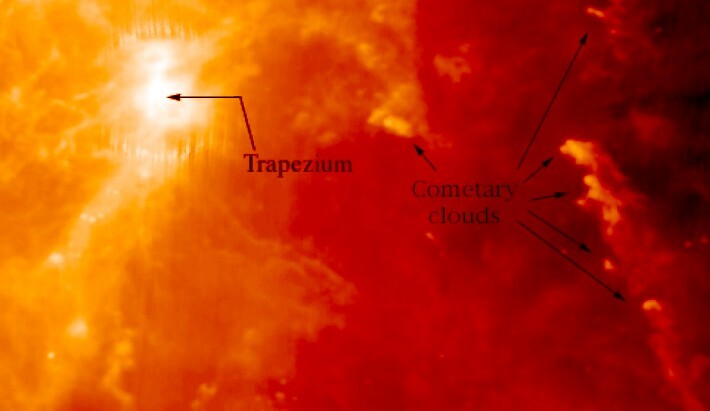 Besides those indicated by the arrows, more comet-shaped clouds or globules are present in this image.